WASHINGTON (Reuters) - Lindsay Walters, one of the original communications officials in U.S. President Donald Trump's White House, plans to resign soon to join the private sector, White House press secretary Sarah Sanders announced on Tuesday. Walters, a former Republican National Committee aide who has been a deputy White House press secretary since Trump's presidency began, is going to be vice president for U.S. public policy at Edelman, a global communications firm. She will leave the White House in mid-April and will be based in Washington. A search is under way for a successor. "I am humbled to have walked through the halls of history and thankful for my incredible colleagues in the administration, as well as those in the press," Walters said in a statement. Walters, 29, has been a key player in communications surrounding the White House's trade and economic policy, and White House senior economic adviser Larry Kudlow said he found her to be "fast-acting, tough minded, and laser focused on messaging." 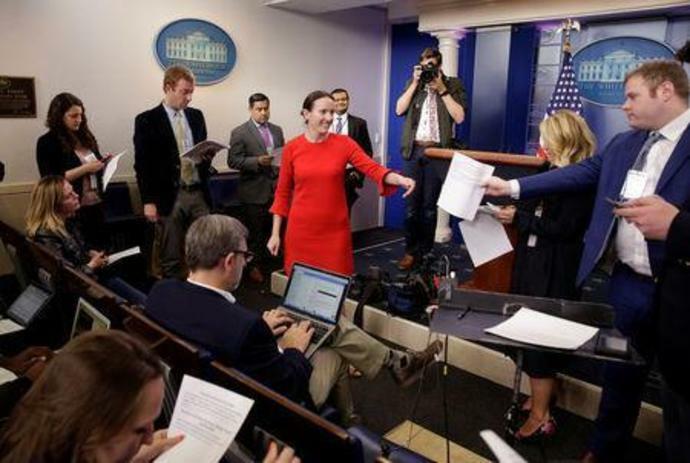 Walters also was the press aide responsible for coordinating the news media's access to presidential events at the White House and on Trump's travels around the country and the world. "Her focus, loyalty, and professionalism are unparalleled. Lindsay has helped us thrive every day and her steadfastness is matchless," Sanders said in a statement. Acting White House Chief of Staff Mick Mulvaney said Trump appreciated her service. "There are few talents who also have the savvy, sophistication, and street smarts to thrive inside a West Wing as intense as this one. Lindsay Walters is one of them," he said. The Trump White House has had a large turnover in senior staff, and Walters has been one of the few who were hired early who is still in place. She was brought on by Trump's first chief of staff, former Republican National Committee Chairman Reince Priebus.